When I was pregnant, I didn't want to stop being active. I did some research, chatted with some doctors, and decided that it was safe for me to continue climbing at an easy level, on toprope until it didn't feel "right" anymore. And while I enjoy climbing routes in the gym, my favorite thing is to be in the mountains climbing. Luckily, Yosemite is my home and my husband Randy was willing to lead me up easy routes. During my previous ten or fifteen years in Yosemite I had mainly focused on doing ground-breaking ascents or climbing on El Cap. I had only climbed the Nutcracker once and had never climbed at Church Bowl Tree. Thankfully, Yosemite seems to offer a lifetime of routes and exploring no matter what the grade. These were my favorite three routes while I was pregnant and honestly, I still love going out and doing them today! Hope you enjoy! For all three routes I take a set or two of Master Cams and a set of Ultralight Curved Nuts. I love the Adjustable Gear sling for racking. Also, add in shoulder length slings and a handful of the FS Mini 'draws. For more beta on what I take on a route, watch this video. The Supertopo Yosemite Valley Free Climbs book has great info on each of these routes as well. After 6 - Probably the easiest of the three routes. The first pitch is pretty slippery and polished, and the crux for me. But once you get past that, it's incredibly fun. Face holds, crack climbing, slab climbing, the route offers a ton of variety and a wonderful summit. In addition to the nuts and cams, bring a few extra shoulder-length slings as it can get pretty wandery in spots. Munginella - This is a bit shorter than After 6 and provides great afternoon shade. I had no idea this area even existed before we did this route. It's a great route for working on your corner climbing with a tricky section at the top. Commitment - Just to the right of Munginella and a few grades harder. It also follows a right facing corner, with a tricky section at the top. Once you feel comfortable on Munginella, this is the perfect climb to graduate to. 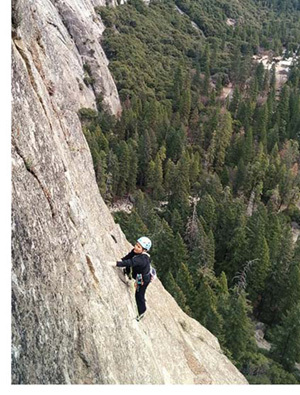 And, if you are feeling extra psyched, climb Selaginella to the Yosemite Falls Trail. It adds a few extra pitches, including a tricky wide pitch down low.